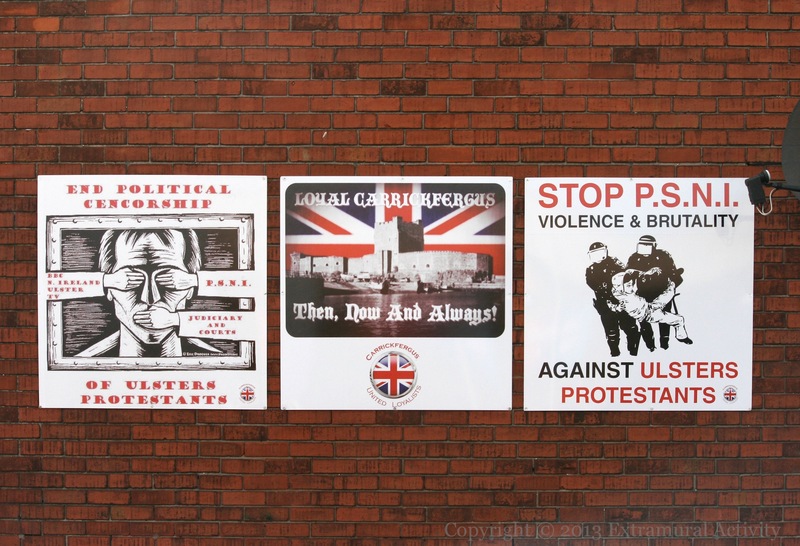 Three panels adjacent to the new UVF ‘Inclusion’ mural in Carrickfergus, two of which protest perceived discrimination against Protestants. The panels at left and right mention the PSNI, while in the left one the BBC and UTV and the judiciary and courts are mentioned in addition. The sponsoring group – Carrickfergus United Loyalists – have a Facebook page. Three political panels in Carrickfergus detailing Loyalist frustration from the union flag protests. More have been added and still more due to be added by the Carrickfergus United Loyalist forum, which formed at the outset of the protests.